We report a case of EDTA induced pseudothrombocytopenia (EDTA-PTCP) in a patient who was treated with platelet transfusion and with refractory thrombocytopenia was referred to us. The Automated blood analyzer and peripheral blood smear examination revealed numerous platelet aggregates, leading to falsely low platelet count on automated hematology analyzer. The case emphasizes careful examination of peripheral blood smear to rule out this form of in vitro phenomenon which can save the patient from unnecessary transfusions and invasive diagnostic procedures. Ethylenediaminetetraacetic acid (EDTA) is the most common anticoagulant used in routine hematology. The trend in modern day pathology is a large reliance on automated analyzers, where it may cause spurious low platelet counts. Its prevalence in the general hospital population is approximately 0.1%. The cause of this peculiar phenomenon is attributed to in vitro platelet clumping due to antiplatelet antibodies in blood having EDTA anticoagulant. There are certain findings which can elucidate this phenomenon such as platelet agglutination in blood smear and platelet count normalization in citrate sample a leukocyte histogram.,, Since unrecognized EDTA-induced pseudothrombocytopenia may lead to inappropriate treatment, it should always be considered a possible differential in patients with thrombocytopenia. We are reporting a case of EDTA-induced pseudothrombocytopenia. A 50-year-old male patient was referred from outside hospital with the complaints of fever, body ache, nausea, and vomiting for a month. The outside investigations revealed hemoglobin 10.6 g/dL, red blood cell count - 3.98 × 109/mm3, white blood cell (WBC) count 14.2 × 103/mm3, and platelet count 35 × 109/mm3. Liver function test and renal function tests were within normal reference range. The patient was HIV and hepatitis B antigen negative. The patient has received four units of platelet concentrate, random donor platelet in the outside hospital. There was no improvement in the platelet count, which after transfusion were 45 × 109/mm3. The patient was referred to us as a platelet refractory thrombocytopenia case. On workup, we found that the patient had no history of bleeding, hemorrhagic disorders, medications, bleeding manifestations, lymphadenopathy, or jaundice. All biochemical tests were within normal limits. Serological tests for dengue fever, leptospirosis, typhoid fever, and malaria were negative. Routine complete blood counts demonstrated hemoglobin 10.8 g/dL, red blood cell count - 4.13 × 109/mm3, WBC count 19.2 × 103/mm3, and platelet count 60 × 109/mm3 on an automated hematology analyzer (Sysmex XN 1000) a subsequent peripheral blood smear examination demonstrated numerous platelets clumps in peripheral blood [Figure 1]. A repeat blood sample in non-EDTA, citrate collection tube showed platelet counts 160 × 109/mm3, which were within normal range in concordance with a peripheral blood smear. The peripheral blood smear did not show platelet clumps in the latter sample. This increased suspicion of EDTA-induced thrombocytopenia as the cause of low platelet count on automated hematology analyzer in the first sample. The cause of incorrect low platelet counts was proved by simultaneous analysis of blood samples collected into EDTA anticoagulant and citrate anticoagulant as a control sample. The EDTA sample was again rerun on automated analyzer after 2 h, 8 h, and 24 h and demonstrated platelet counts of 48 × 109/mm3, 42 × 109/mm3, and 34 × 109/mm3, respectively [Table 1]. There was the absence of falsely low platelet count in citrate sample and decreasing platelet count in EDTA sample were noticed. The decrease in platelet count was accompanied by an increase in the number of leukocytes, so-called pseudoleukocytosis. The EDTA sample was incubated at 37 C0 for ½ h, but the platelet counts did not increase suggesting that the cause of falsely low platelet was EDTA only and not cold agglutinins. Finally, a diagnosis of pseudothrombocytopenia attributed to EDTA was made. EDTA-induced pseudothrombocytopenia is not a disease itself; it has been described in healthy subjects. It was Gowland et al. who first of all reported EDTA-induced pseudothrombocytopenia in 1969. It was referred as “laboratory disease” by Gschwandtner et al. in 1997. The underlying mechanism is the binding of the antiplatelet antibody to the surface glycoproteins located on platelet cell membrane. These antibodies recognize Group IIb–IIIa receptors on platelet and trigger activation of tyrosine kinase which in turn causes platelet agglutination leading to spurious low platelet counts. Citrate anticoagulant has also been implicated in the development of spurious platelet counts but with a lower frequency as compared to EDTA. Lack of sign and symptoms of platelet disorder/dysfunction. As in our case, the platelet count was <100 × 109/mm3 with normalization of platelet count in citrated blood. 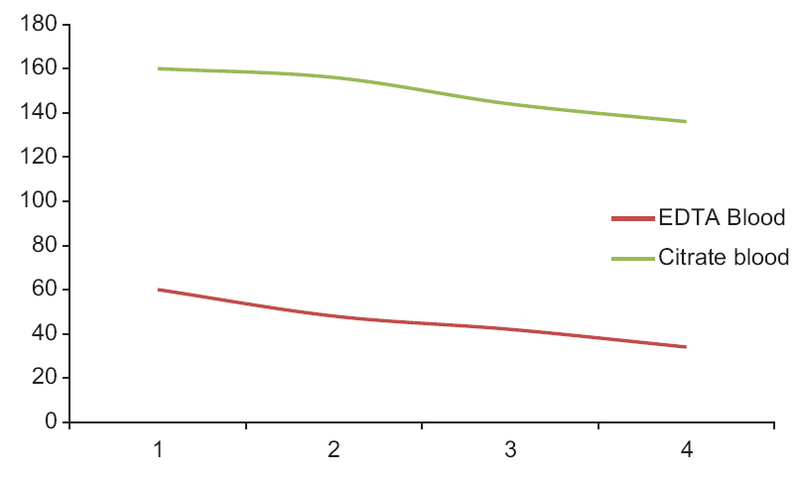 There was a time-dependent fall in platelet count by the automated analyzer as depicted in [Table 1], [Figure 3]. The WBC histogram showed a small peak (marked by arrow) which should alert the technician as it can be attributed to platelet clumps leading to spurious low platelets [Figure 2]. Any such peak that arises in histogram before the normal peak together with low platelet count needs careful workup as this can be an ominous finding for pseudothrombocytopenia. 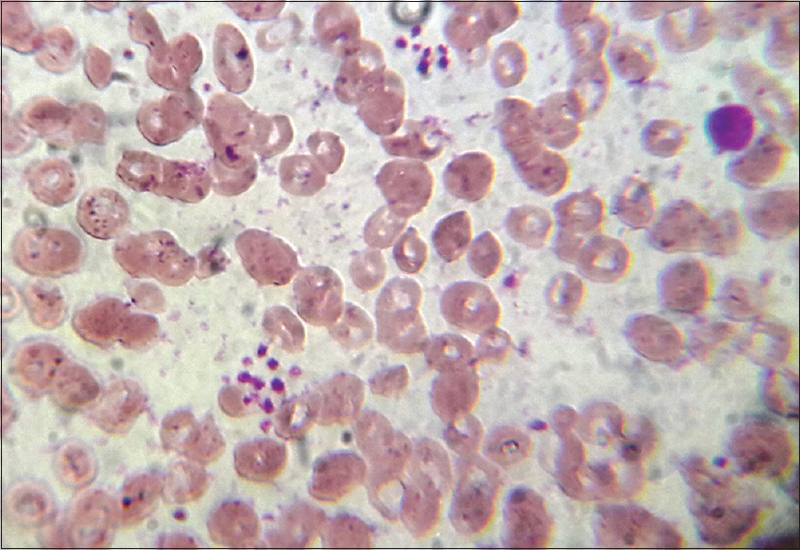 Platelet aggregation was marked on peripheral blood smear with no ominous sign or symptom of platelet disorder [Figure 1]. Preliminary workup of the patient included an ultrasonography of abdomen, blood culture studies, serum procalcitonin level – all these were within normal limits ruling out sepsis as a cause of pseudothrombocytopenia. There was no significant finding or clinical suspicion of malignancy. Like this case, no other cause for thrombocytopenia was found, and the platelet counts improved on the non-EDTA sample, a diagnosis of EDTA-induced pseudothrombocytopenia was made. We refrained from performing a finger prick blood smear examination as they are prone to get diluted by tissue fluid leading to falsely low platelet counts. 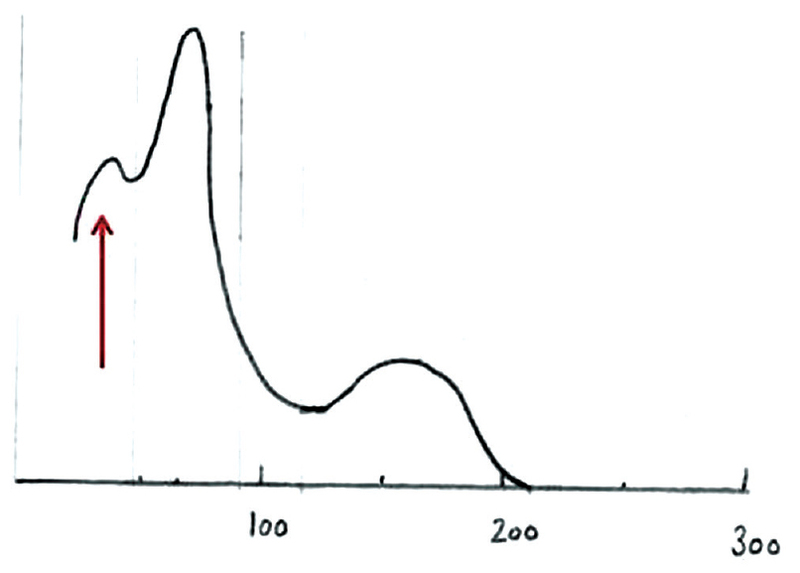 An interesting finding was the presence of a peculiar peak in WBC histogram as shown in [Figure 2]. On comparison with normal control, one can appreciate that such peaks on WBC histogram are uncommon finding and require further studies to ascertain the relevance of such peaks and their correlation with spurious low artefactual platelet counts. The case demonstrates in vitro low platelet count due to an EDTA-induced mechanism which was resulted in spurious low platelet count estimation by automated analyzer leading to erroneous in vivo platelet count. This ultimately resulted in unnecessary platelet transfusion and work up. Clinicians and pathologists should be aware of such artifacts. The trend in modern day pathology is to lessen the need to review blood smears, both by high output laboratories and by small laboratories with scarcity trained workforce. Too much dependence on automated instruments with minimum slide reviews by trained pathologist cause delay in diagnosis and futile intervention. It is necessary that the sample with unexpected blood count in relation to the clinical settings or those that generate unknown peaks on histograms necessity a careful review of blood smear along with clinicopathological correlation to ensure better-justified patient management. Rod S, Hangerman DO. Ethylenediaminetetraacetic acid dependent pseudo-Thrombocytopenia: A case report of an incidental but important finding. Med Online 2000;12:120-3. Shreiner DP, Bell WR. Pseudothrombocytopenia: Manifestation of a new type of platelet agglutinin. Blood 1973;42:541-9. Ohnuma O, Shirata Y, Miyazawa K. Use of theophylline in the investigation of pseudo-thrombocytopenia induced by EDTA. J Clin Pathol 1988;41:915-7. Gowland E, Kay HE, Spillman JC, Williamson JR. Agglutination of platelets by a serum factor in the presence of EDTA. J Clin Pathol 1969;22:460-4. Gschwandtner ME, Siostrzonek P, Bodinger C, Neunteufl T, Zauner C, Heinz G, et al. Documented sudden onset of pseudothrombocytopenia. Ann Hematol 1997;74:283-5. Fitzgerald LA, Phillips DR. Calcium regulation of the platelet membrane glycoprotein IIb-IIIa complex. J Biol Chem 1985;260:11366-74. Bizzaro N. EDTA-dependent pseudothrombocytopenia: A clinical and epidemiological study of 112 cases, with 10-year follow-up. Am J Hematol 1995;50:103-9. Lippi G, Plebani M. EDTA-dependent pseudothrombocytopenia: Further insights and recommendations for prevention of a clinically threatening artifact. Clin Chem Lab Med 2012;50:1281-5. Nilsson T, Norberg B. Thrombocytopenia and pseudothrombocytopenia: A clinical and laboratory problem. Scand J Haematol 1986;37:341-6. Yamada EJ, Souto AF, de Souza Eda E, Nunes CA, Dias CP. Pseudothrombocytopenia in a patient undergoing splenectomy of an accessory spleen. Case report. Rev Bras Anestesiol 2008;58:485-8.